A number of fans have written regarding the use of non-English languages in Jonny Quest, mostly wondering if the utterences issued were accurate or "mumbo-jumbo", but occasionally offering some keen insight. Episode-specific information may also be found in the Episode Guide (or by following the link for the episode in the table below). "A number of JQ episodes take place in Chinese settings or feature Chinese characters. In re-watching the series as an adult (who now speaks some Mandarin) I was surprised to discover that the amazing detail of the art which I recalled so well sometimes extended to authentic Chinese characters! In the street scenes of the episodes Terror Island and The Quetong Missile Mystery, some of the characters appearing on signs are legible. Although many of the signs are indistinct or partially obscured, characters like "store", "rickshaw", "wine", and "bank" can be read. One doorway is labeled "Technology Dept" (aside: the Chinese characters for "technology" have the literal meaning "art of trickery"!). Inside the Quetong (correctly pronounced "chya-tong") missile bunker, Race creeps past a partially visible sign reading "... entrance/exit". He opens a door to find two guards slumped over a table. The sign outside the door reads "Men's Lounge" or "Men's Waiting Room". When Dr. Chu Sing Ling gets toasted by an electrified fence, the Chinese on the sign reads "Danger, High Voltage, Attention". The Quetong guards wear costumes sporting a single character that looks like an upper-case "T" with a second, shorter horizontal bar. Although this is not itself a Chinese character, if you switch the horizontal bars so the shorter one is on top, you have the character "gan" which can mean "shield" (a case of artistic license?). Bob Perman writes: "Another ligature design mentioned was the General Fong's "F." You can call it a symbol or whatever, but I think the explanation is pretty simple. It's well-known that Alex Toth designed the characters for that particular JQ episode, and Toth sometimes coupled letters together in back-to-back mirror-image fashion to create interesting designs. On Birdman, Toth did Reducto with double-R's. On Herculoids, he did Brotak (bubblemen leader) with double-B's. On Samson, he did Kunev Khan with double-K's. So General Fong's symbol is really just a double F laid back-to-back. An efficient and effective design. In other words, classic Toth." See the images of examples referred to by Bob above, which he sent along with his note. Unfortunately the spoken Chinese appears to be merely attempts at imitation. Chinese languages are tone-based, and none of the Chinese in JQ is spoken with anything like accurate tones. The Hong Kongers in Terror Island do not speak Cantonese, and neither the Quetong inhabitants nor Charlie (the Star of Borneo's cook) appear to be speaking Mandarin or Cantonese (although it's curious that the Quetong guards speak in English to each other - recall that Race is once able to reply over the walkie-talkie!). I suppose it should be no surprise that the accuracy of the spoken Chinese does not match the written. It is much easier for artists to copy Chinese characters than for voice actors to convincingly speak the many foreign languages which appear in JQ. Nonetheless, the series deserves very high marks for visual accuracy. I wish I knew some Japanese so I could comment on Dragons of Ashida (Sumi: "Idawa! Idawa! "), but someone else will have to clear that one up!" Another fan wrote that the phrase spoken by the unfortunate man (who heard a noise and investigated only to wind up being chased by a giant crab) at the beginning of the Terror Island episode was Chinese for the equivalent of "Who's there?" The following table lists Jonny Quest episodes in which a foreign language was used. As information trickles in, I will update these entries to reflect whether the dialogue actually used was accurate or gibberish. As always, comments are welcome. Several men questioned by Jade say a short phrase, possibly meaning something like "I don't know"
The guards on Moy Tu island speak a number of Chinese-sounding words as Race and the boys upset their world, and also when the enlarged lizard rises from the waters of the lagoon. A few phrases of Chinese (Cantonese, spoken in a Toishan accent) are spoken by Charlie, the cook left behind on the trawler. In the freezer, he says "Go away! Go away! I'll chop your head off!" Later on deck, he says "Go away! Leave quickly! Leave quickly!" Spoken language is mostly gibberish (there are some exceptions); the written language seen is usually fairly accurate. Japanese? Dragons of Ashida Surmised from a few clues; spoken by Dr. Ashida, Sumi, and the native who escaped from the dragons. Richard Lyons wrote: I checked the subtitles for the scenes where the servant appeared. In one scene, Dr. Ashida calls the servant Himoki, and that is depicted in the subtitles. In the other, where you thought he might be being called Kuru-something?, there were no subtitles. Checking further, I discovered that whenever the foreign language (Japanese, Mandarin, or whatever) is spoken, there are no subtitles. So, apparently Dr. Ashida is issuing a command, not calling a name. I then checked a Japanese-English dictionary on-line, and discovered that a possible meaning for "kuru" is "come" or "come over". So, perhaps he is commanding Himoki to come get the Quests. Brian (on the forum) wrote: It seems that Ashida is Japanese. His name could be Japanese. [But] Ashida commands, "naga kazachi", which has no meaning in Japanese and doesn't follow Japanese grammar rules. This is also true of "naga kaihachi", another command, and "sukaka, sukai" with which Sumi commands the lizards. Interestingly, "naga kazachi" and "naga kaihachi" do seem to follow some kind of grammatical rule. Perhaps "chi" is a suffix. But not Japanese. By the way, Sumi sounds like a Japanese girl's name. um lagarto marinho...voou para o barco"
a sea lizard...it flew for (or came toward or came at) the ship"
This is very close to what Roberts reported as he translated the words for Mr. Corvin. "Si" (yes) and "Señor" (Sir or mister): used by Montoya in "Treasure of the Temple", Jose in "Skull and Double Crossbones", and Alvero in "The Dreadful Doll"
"¡Arriba!" (Up!) used by "the chief" as a command to order his men to come up on deck in "Skull and Double Crossbones". "¡Rápido!" (Fast!) used by Montoya in "Treasure in the Temple" as a command to the natives rowing the boat as the Quests are being chased. Montoya in "Treasure in the Temple" on two occasions, when asked how far to the lost city, answers with the phrase "No sabe". He is incorrectly using the third person (i.e. "He/she does not know."). From the context, he clearly intends to say "I don't know." which in Spanish would be "No sé." Dr. Quest in "Shadow of the Condor" says "Adios" (goodbye) to Julio as they leave. German The Devil's Tower Valid German phrases, accurately used by both Klaus and the cavemen: "Kommen sie heir!" = "Come here, you!" Dutch Attack of the Tree People Spoken by the captain of the ship that rescued Race and Dr. Quest to his crew; exact words unknown. unknown language Treasure of the Temple Unknown. Quite a bit of spoken language from the friendly native who helped the Quest party escape from Perkins and Montoya. unknown language 2 Treasure of the Temple Unknown. Montoya spoke a rough-sounding language to the natives he was apparently working with to prevent the Quests from reaching the lost city. This language sounded different from the more fluid-sounding language spoken by the friendly native (see above entry). Pursuit of the Po-Ho Unknown. The language by the natives; both Dr. Quest and Dr. Hartman could at least understand it. Indian language - exact tribe unknown Werewolf of the Timberland Unknown, although it seems likely this was not just nonsense; the words were very distinct. This is heard when White Feather gives instructions to the wolf, Grey One, to find Bandit. Egyptian (or Arabic?) Curse of Anubis Unknown, although it seems likely this was genuine; the words were distinct and some were repeated. This is heard mostly when the two henchmen are in pursuit of Jonny and Hadji, but also from the men they spent some time with in the desert. unknown language The Invisible Monster Unknown. Just a few fragments, mere words, really, from the unlucky island dweller who is about to meet the monster. It may have been that he was commanding his dog (who was carrying on quite a bit at the monster's approach) to be quiet. unknown language A Small Matter of Pygmies Unknown. Another language from South America. This time from the pygmies encountered by the Quests after their plane crashed in the southeastern part of Brazil. Mostly angry words from the pygmy leader as things just did not go his way. It is not known if these utterings were based on a real language or whether it was just gibberish constructed for the episode. 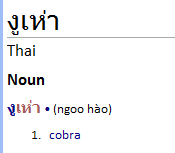 Thai Double Danger In the episode "Double Danger", which takes place in Thailand, one of the locals says "Ngu Haw" in Thai which means "Cobra". (Contributed by Mitchell Jones.) This was "confirmed" using an online translation engine which yielded the following result.